More than 40 years after the first Moon landing, only a very select few have set foot on that surface. 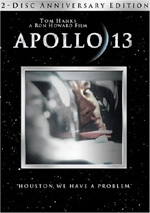 A mere 12, as a matter of fact, and along with their fellow Apollo astronauts, they reside at the heart of a documentary called In the Shadow of the Moon. 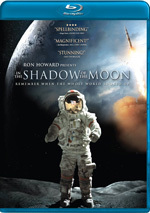 In the Shadow of the Moon appears in an aspect ratio of approximately 1.78:1 on this Blu-ray Disc. With its mix of new interviews and archival footage, Shadow was acceptable for this sort of program. Overall, the new footage looked good. Sharpness was usually fine, though some elements could become a bit fuzzy at times. Those instances weren’t major, though, and the interviews generally appeared concise. Colors were reasonably natural, though not particularly lively. No notable defects affected the new footage. Blacks and shadows followed suit, as they seemed decent but unexceptional. Overall, the visuals were acceptable for this kind of show. Unlike the material for most documentaries, the DTS-HD MA 5.1 soundtrack of Shadow was pretty lively. The soundfield opened up the material to a surprising extent, especially in terms of effects. Rocket launches used the side and rear speakers well and better immersed us in the action. Other environmental elements came from those channels, and music featured nice stereo imaging. These pieces fit into the package well. How did the picture and sound of this Blu-ray compare to the 2008 DVD? Audio remained very similar, as the lossless DTS mix didn’t do anything significant to improve upon its predecessor. Mastered at a rather low level, I had to turn up the volume louder than normal, and that tended to rob the audio of some impact. Visuals demonstrated decent improvements, though. Obviously, the problems with archival material still appeared, but those clips demonstrated a bit more clarity, and the interview shots boasted superior definition. The nature of the documentary meant the Blu-ray wasn’t a stunning step up in quality, but it did fare better than its predecessor. Both discs include the same extras. We start with an audio commentary from director David Sington, editor David Fairhead, and archive producer Chris Riley. All three sit together for this running, screen-specific chat. They discuss editing and the film’s construction, sound and music, interviewing the astronauts and impressions of them, cinematography, aspects of the archival footage, and some historical background. We can watch the movie with or without an Introduction from Ron Howard. In this one-minute and 33-second clip, Howard gives us a brief overview of the film. It’s pleasant but not essential in any way. 18 Bonus Interviews and Stories fill a total of 57 minutes and 24 seconds. Across these we hear from the various astronauts as they discuss topics like their military service, the progress of the space race, and their experiences in the program. These snippets look like they came out of a “finished” version of the movie since they come with archival footage, so they don’t just provide raw interview shots. I don’t get the impression they were dropped for content-related reasons, as they’re uniformly interesting. Perhaps they would’ve made the final product drag, but taken here, they offer lots of good comments and information. Ron Howard: Inspired By Apollo runs six minutes, 34 seconds and provides remarks from Howard. He talks about his experiences with astronauts and his thoughts about Moon. Howard doesn’t tell us much in this fairly fluffy appreciation. A trailer finishes the package. Though many documentaries and feature films have examined the space program over the years, its concentration solely on the words of actual astronauts makes In the Shadow of the Moon unusual and special. The piece offers a great perspective on their experiences and remains consistently fascinating. The Blu-ray presents fairly good picture and audio along with some interesting extras highlighted by almost an hour of bonus interviews. I like this film very much but find it hard to advocate the purchase of this Blu-ray, at least for folks who already have the original DVD. If you don’t own Moon at all, then grab this release; it’s reasonably priced and quite enjoyable. But even with that low MSRP, I don’t think the Blu-ray offers enough of an upgrade for those who own the DVD.